Zion National Park was established in 1919 and was Utah’s first. Located in the southwestern part of the state near the city of St George, Zion is easily accessible from Interstate-15 from both Las Vegas to the south and Salt Lake City to the north. In this beautiful red rock area there are over 146,000 acres set aside protected by the National Park Service which draws an annual visitorship of over 3 million people. Most of these travelers are coming for the day, and they will be awed by the spectacular landscape, however, if you can plan and extra day or two here you will be very glad that you did. There is much to do at Zion for all ages, here our the top 5 from the Wandering But Not Lost perspective that will give you a great feel and understanding of the Park. Mt Carmel Tunnel – Either on your way into Zion Canyon or when you are leaving the Park, make sure that you make a point to drive through the Mt Carmel Tunnel. The tunnel was built over a ten-year period between late 1920 and 1930. It is 1.1 miles long and was a major construction feat. It was the longest tunnel of its kind in the US at the time and was built to open access along Utah’s southern land which includes a couple other well-known destinations; Bryce Canyon and the North Rim of the Grand Canyon. A unique feature of the tunnel is a series of ‘windows’ that were cut for ventilation purposes, which provide light and quick snapshots of the red rock cliffs outside of the tunnel. The Cabins at Zion Lodge – If your itinerary allows a multi-day stop we recommend staying at the in-Park Zion Lodge. Not only will you get a more immersive experience but you will also be able to drive and park at the lodge, which during the busier months gives you a little extra since all other vehicles will have to park at the Visitor Center. The Lodge was designed by Gilbert Stanley Underwood in 1925 (He also designed the incredible Ahwahnee Hotel in Yosemite which opened in 1927). The lodge consists of the original lodge buildings and 28 adjacent cabins that were added a bit later. The cabins are nestled together but you get a sense of privacy and a oneness with the surrounding sand-stone cliffs, Virgin River, and quiet of the canyon. Most of the cabins are built as duplexes so if you have a larger group you can book both and the adjoining door can be opened for more room. Each has a gas fireplace and a porch where you can start and end your day, taking in the fresh Utah air. If you are an animal lover, there is a great chance that you will encounter deer and the famous wild turkeys that inhabit the area. Emerald Pools – This is a great way to get to know the landscape of Zion. The trailhead is located across from the Zion Lodge and each pool along the path provides you a different and beautiful experience along the way. The trail climbs as you go and gets a bit more difficult as you pass each pool, with the upper pool taking on a more moderate rating, however, slow and steady wins the race here and the upper pool has a beautiful cascading waterfall that pours over its crescent cliff. Water flow of the fall will depend on the season but whether it’s running a full force of simply dripping with the last drops of the season, it is a magical sight. Angel’s Landing – This is one of Zion’s classic hikes and one that should be on your hiker’s bucket list (if that is your thing). This 5.4 mile hike will take you on an elevation gain of over 1488 feet from the canyon floor to the top, where you will be literally resting with the angels at 5785 feet above sea level. You’ll take the Grotto shuttle stop and head across the footbridge at the Virgin River. This hike will take you though a wide variety of landscapes and it is a feast for the senses. Soon you’ll begin your steady accent up the canyon. The first part of this climb takes you up on the outer side of the cliff, there are great views but little protection from the sun, so if you are doing this hike during warmer months make sure that you start early and wear sunscreen! At the top of your initial climb you will enter the narrow refridgerator canyon, aptly named as you will immediately notice a decrease in temperature as you make your way through. This entire trail is a photographers dream but we find that this area is one of the best places to capture some very beautiful and creative shots. Next up on the list is the 21 steep switchbacks called Walter’s Wiggles, named after Zion National Park’s first superintended, who was the lead in getting the trail to Angle’s Landing built in 1926. Once you navigate through the wiggles you will reach Scouts Landing. It is the perfect spot to catch a break before you tackle the most exciting part of the hike. You are a half a mile out from your destination now. This part of the hike is not for anyone who has a fear of heights. You will be on narrow pathways and will use the assistance of fixed-chains on the cliffside to hold on to. Don’t rush this portion of the trail, not only will it be safer to take this a bit slower, but you really need to soak up this experience. This is a hike that we believe is about the journey just as much, if not more, than the destination. Once you do reach the summit you are in for a treat along with the very best view of Zion Canyon in all directions. What a great place to rest a bit and enjoy a snack or the the celebratory lunch that you packed for the adventure. Even though you’ve seen the sights on the way up I guarantee that you will experience it differently on the way down. Perhaps it’s the endorphins and adrenaline still in overdrive – but this hike just may change you – forever! Riverside Walk – Located at the far end of the canyon at theTemple of Sinawava shuttle stop is the Riverside Walk. This 2.2 mile round trip trek is a good one for all ages and, once again, immerses you into the landscape of the canyon itself. You will be walking near or next to the Virgin River under a canopy of trees, moss and fern covered grounds. This walk is beautiful all year around and will be a different experience with the changing of the seasons. 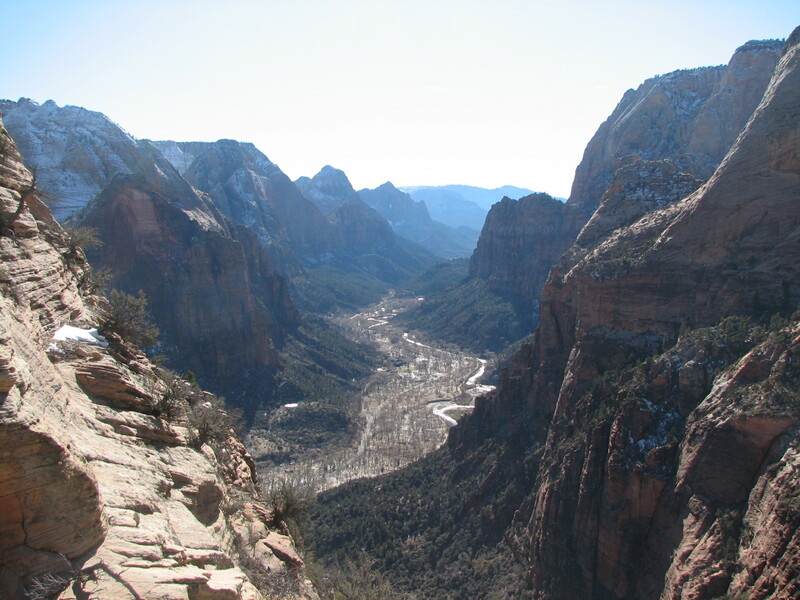 This is also the gateway to the other popular and famous Zion hikes – the Narrows. To be honest, the Narrows hike is one of the best hikes we’ve ever taken and the only reason that it is not on this top 5 list is because it takes planning, preparation, and time so it won’t be on the agenda for most travelers. With that said, if you like adventure, it should definitely be on your list. You can learn more about the Narrows HERE. Zion National Park is a gem in the system – although they all are in their own way. Get Up and Get Out to #FindYourPark! Catch our Weekly Travel Log Updates on Blab.im.